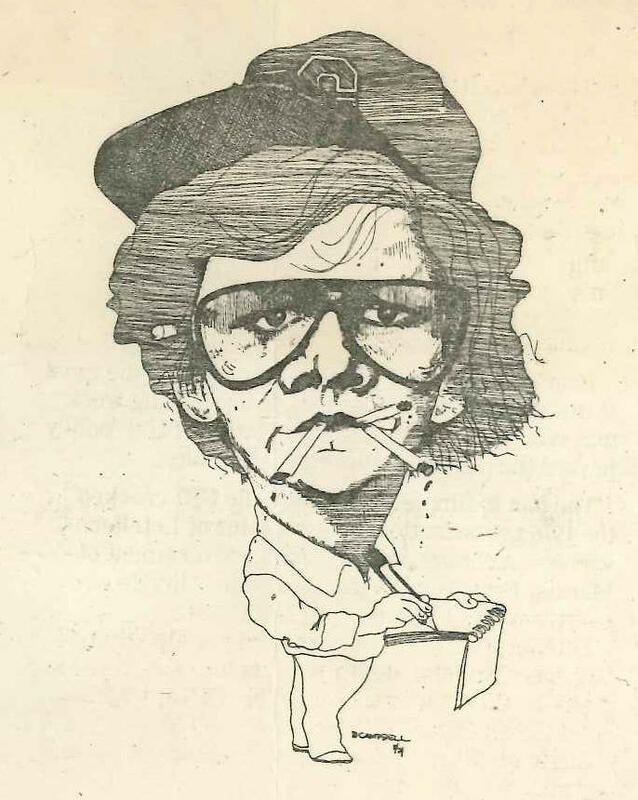 A caricature of Howard Wilkinson that accompanied his column at the Troy Daily News. I am not the kind of ex-smoker who goes around like a Bible-thumping preacher, predicting damnation and eternity in a place hotter than a Zippo lighter if you do not stop this filthy abomination toute de suite. I must presume that if you are reading this column, you are an adult and quite capable of making such decisions for yourself. Any fool knows the health risks of smoking, and I know that – after all those years of sucking down smokes – I'm not in the clear now either. I found out the hard way many years ago that there is more risk to smoking cigarettes than health problems. It can also create some incredibly embarrassing moments. Five of the best years of my career in journalism were spent in Troy, Ohio, the county seat of Miami County, just about 75 miles north of downtown Cincinnati on Interstate 75. There, I worked as a multi-tasking reporter for the Troy Daily News. In those days, The TDN, as we called it, was a really good little newspaper with a daily circulation of 11,000 or 12,000, with very talented and good people working there. In my humble opinion, those were the glory days of the Troy Daily News. I did a whole lot of things for that newspaper – wrote a humor column on Sundays, covered politics, worked with the photographers on big take-outs for the Sunday paper, did a stint as the arts and entertainment writer and editor, and covered Miami County government. You tend to wear lots of hats at small-town newspapers. Most days at the Troy Daily News, an afternoon newspaper, I started with making the rounds of the county courthouse and county government building, looking for news. Just about every morning, I'd end up in the little coffee shop/snack bar in the basement of the County Administration Building. County elected officials would often stop by to shoot the breeze and dish the gossip, and there would usually be several reporters there to gobble it all up. There was one morning in particular that I will never forget – I believe it was in 1981. I know it was the dead of winter because I came marching into the snack bar wearing my heavy – and extremely beat up – winter parka. There were a couple of county officials there. There were two of my fellow reporters as well. There was Steve Baker, who was then – and is to this day – the reporter for WHIO-TV in the counties north of Dayton. He was doing double-duty in those days, working too for WPTW Radio in Piqua, just up the road from Troy. And there was Bill Fox, who had, since 1961, been the Dayton Daily News' correspondent in Miami County, writing for my hometown newspaper. Now, this was in the days before smoking was banned in public places and public buildings. Ashtrays abounded in the offices of Miami County and in the courtrooms too. That morning, there were two cigarette smokers sitting at the table – a county commissioner and me – and, if I remember correctly, Bill Fox was a pipe puffer and probably was further polluting the air of the snack bar. But nobody ever complained; the blue haze of cigarette smoke was just a part of daily life. We were having a big old time – telling jokes, solving the problems of the world, gossiping about everybody who walked by. The smoke was rising in the snack bar. Suddenly, it was no longer just part of the background smells. Steve looked over at me and saw something amazing. Great clouds of smoke were pouring out of the right-hand pocket of my parka. My coat was on fire! A few flames leaped up out of the pocket; the smoke billowed. Guys were jumping up and running from the table, in case I was about to explode. The woman behind the counter was just about to call the Troy Fire Department when I grabbed my 24-ounce cup of black coffee and dumped the whole thing in my burning pocket. Then I ripped off the coat and stomped on it a few times until I was sure the fire was out. By this time, everybody in the place was doubled-over in laughter. Except me. I was mortified. In a small town, news spreads fast. By lunch time, I had a different coat on, but everyone I saw was holding back laughter and asking me about the burning coat. I put it out. It's done. Forget about it. Bill Fox, though, would not forget about it. Somehow, he talked the Dayton Daily News editors into letting him write a three-paragraph story which ran inside the local news section. In my hometown newspaper. Where all my family and friend could see. He didn't quote me in the story. He knew better than to approach me for a quote. To this day, when I go back to Troy – something I love to do – someone stops me and asks me about the burning coat. Thirty-seven years and six U.S. presidents have come and gone since then, and Troy is still talking about my charred parka. So, I beseech you – don't smoke! You could become a laughing stock for life. 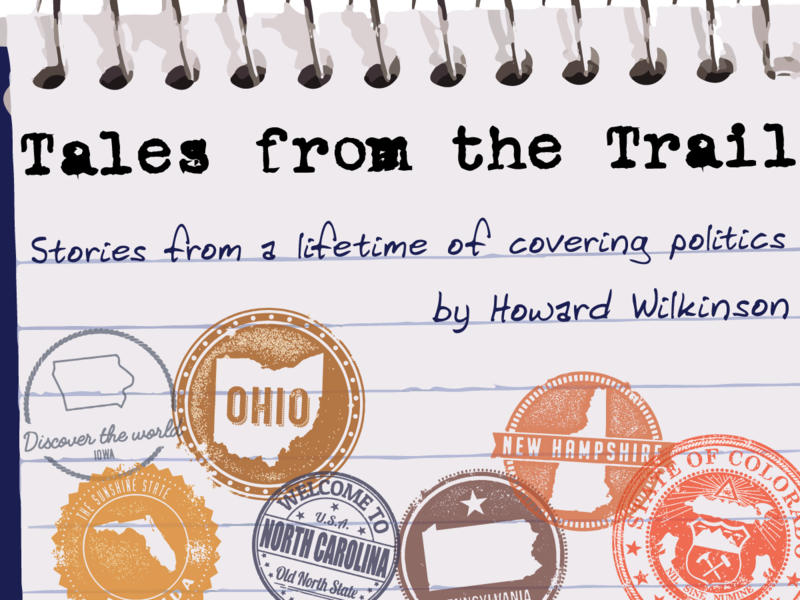 "Tales from the Trail" is Howard Wilkinson's weekly column that gives a behind-the-scenes look at his more than 40 years of covering the campaigns, personalities, scandals and business of politics on a local, state and national level. Read more here.